Hello! Today's Fashion Over Fifty Post is all about the Classic Peasant Top which seems to never go out of style. I've always loved peasant tops because they are so comfy. Most of them are made of a cotton gauze, but the one I'm wearing in the photo below is a knit material. I bought it from T.J. Maxx last year, but it's such a classic and versatile top, I can still wear it this year too. It has an elasticized waist, and is very roomy in the tummy....just where I need to be roomy. I felt this peasant top was the perfect match to go with the ethnic print in my new Joe Fresh skirt which I purchased from J.C.Penny. While I was checking out, the sales clerk informed me that Joe Fresh was the number one selling clothing brand in Canada. Who knew? I can certainly see why, the clothes are so fun, colorful, fashionable, and comfortable. For jewelry, I wore a seed bead crocheted bracelet that's the same color as the skirt, and a Tori Spelling Bohemian Necklace, which were both purchased at JoAnn's Fabrics and Crafts. My earrings are a simple clear brown bead that dangles from the lobe. These sandals were one of my favorite finds this year. First of all, their wedges....I'm always a sucker for wedges because they give you the lift without the discomfort. And for me, when your over fifty, comfort always takes precedence over fashion! Secondly, I love all the bright, fun, colors that are in the shoe. They are all the new colors that are trending this season, wrapped up into one pair of shoes, so they go with just about everything in my closet. I found them at my new favorite shoe store -- Designer Shoe Warehouse. They are made by Italian Shoemakers, and are much cheaper now than when I bought them; if your looking for a late summer sandal. 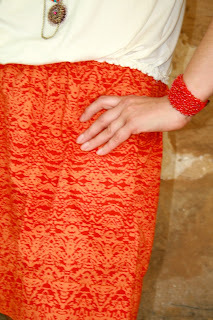 Here's a close up of the print in my skirt, but you can also see a close up in the J.C Penney link I provided above. For a purse, I chose this cross over style from J.C.Penney. Penny's has a purse line called 'Lulu'. I just love the fun style of these purses and I own at least four of them now. I have the purse I'm holding in the picture in two colors...navy and tan. It will be perfect for all the summer traveling and vacations I have coming up when I don't want to lug around a big, heavy purse nor worry about being pick pocketed. It was a hot, sunny, 90 degree day when I wore this outfit. I wore it to church in the morning, and then for lunch and shopping in the afternoon. I felt cool and comfortable all day, yet at the same time stylish. It's nice to have a outfit that keeps you cool, yet is still feminine and fashionable at the same time. Cute outfit! I love the top! Look at the fashion queen!! Gorgeous outfit. It looks beautiful on you!! You look so stylish!! Love the outfit, it look great on you, especially like the colour of the skirt!